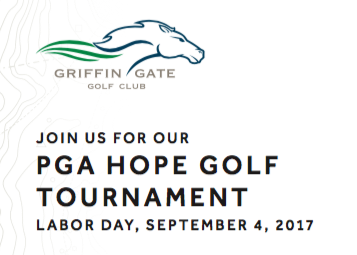 Bidding for the 2017 PGA Hope Golf Tournament here at Griffin Gate Golf Club runs Friday 9/1 at 1pm through close of tournament on Monday 9/4. This amazing charity auction opportunity is open to the public and interested parties may visit the GGGC golf shop to bid in person. Anyone wishing to email a bid, may contact our director of golf, Colin Gooch (Email Colin). Browse auction items below. Bidding is open to the public. For additional details on this year's PGA Hope Tournament, please click here.